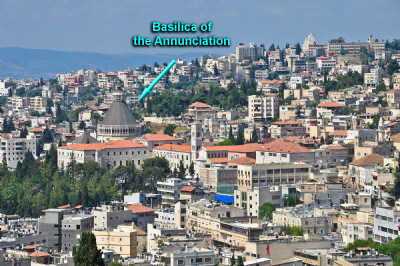 In Jesus’ day, Nazareth was a small insignificant town (John 1:46). Gabriel appeared to Mary there, and later, Mary and Joseph returned there to live (Matt 2:23; Luke 2:4, 39, 51). The village is mentioned 17 times in the New Testament. Jesus eventually left the village for a wider ministry although he was known to some as a “prophet from Nazareth in Galilee” (Matt 21:11). Nazareth is located in the very southern portion of lower Galilee, about 16 mi. [25 km.] west of the southern tip of the Sea of Galilee. Sepphoris, the capital of Galilee during Jesus’ youth was located only 4 mi. [6.4 km.] to the northwest of Nazareth. In Nazareth there are numerous Christian sites the commemorate events associated with Mary, Joseph, and Jesus.